Sprouts are always healthy and even tasty when it’s done right. It contains proteins and vitamins. I love sprouts and make it atleast once in two weeks. It’s very easy to make and you can serve it as a lunch or even a snack. It can make a healthy alternative to any oily snacks. Also if you are dieting you should definitely consider this for one of your meals. It’s a very refreshing and healthy salad. Wash moong dal and soak them in water overnight. After that wash it again, drain them and put it in a muslin cloth and tie them or in a closed container and keep it separate for a day. Sprinkle water once in 6 hours to keep the cloth damp. You will start seeing the sprouts in 10 hours. Leave it few more hrs,damping the cloth or sprinkle some water if you (use the container)in between for longer sprouts. Microwave the sprouted moong with a cup of water for 4-5 minutes. Then drain the water and keep the sprouts separate. Heat 1/2 tbsp of oil in a pan add mustard seeds, urad dal and whole red chilies (optional). And add the chopped onion and fry them for few minutes and add the tomatoes and curry leaves. Cook for about 2- 3 minutes. Then add the sprouted moong with little salt, mix it all together and finally add the shredded carrots. Garnish it with coriander leaves and add lime juice when you serve. Very healthy as well as delicious preparation. Can have it in any time of the day. Your clicks are simply great. Very healthy and tasty dish.. looks amazing dear.. nice clicks too..
My version is just raw salad. May be I should try your version one day. Thanks. Hey Shriya.. this salad looks delicious. 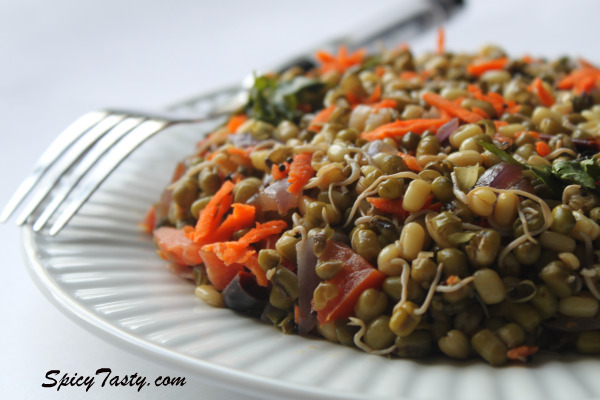 I also just posted sprouts salad! 🙂 Yours is quite different. And it’s nice to have all the variations! Thanks and cheers! question for u…. can we use the regular sprouts tooo? I know there is an indian store that has it….. so can I make the salad with those sprouts? Sure, I don’t see why not!!!! Delicious and healthy salad, looks very yummy! Sounds healthy n delicious…Will def be a must try for me …! Very healthy and nutritious salad! Nice snapshot! never tried anything with moong dal..i see so many recipes online.. Salad looks cool..Healthy way of eating!!! 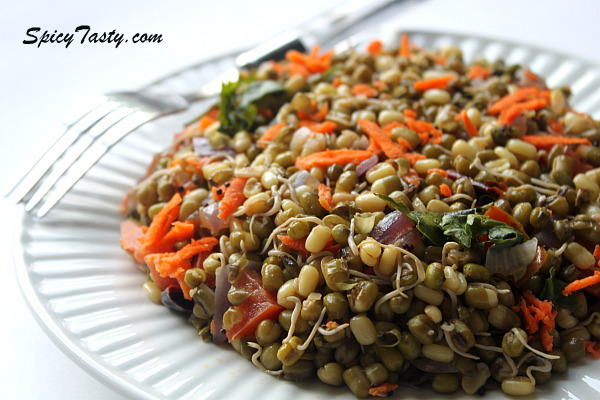 Sprouted moong salad looks colorful and healthy. Looks soooooooooooooooo wondeful and healthy !!! A very healthy salad! As a child I ate many such dishes. Yummy! I’ve never made sprouts like this, but I’d love to try it. Great-looking salad! Tantalizing photos for a lovely and healthy salad. Do you start with fresh or dried moong beans, or doesn’t it matter? These look incredibly fresh. Wow this salad looks healthy colourful and delicious.My 1st visit here, you have a great collection of posts. Do drop by simply food some time. Nice recipe and your food pics are simply great. That’s a beautiful salad! I feel healthier just looking at it…bet it’s delicious too! That’s a pretty bowl of goodness ! Crunchy sprouts are my friends! This salad looks so yummy and healthy! A very healthy and crunchy sprout salad! Healthy and yummy salad, looks tempting. I can’t believe how good it turned out 🙂 Its so good that even though I was supposed to make it for dinner tomorrow with some friends ~ I am gonna end up eating it today. I am glad you liked the dish and it turned out good for you. Thank you for trying out my recipe. 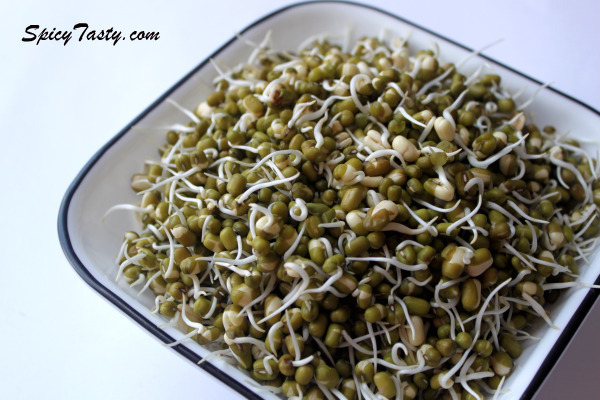 I’ve never tried moong sprouts, but this looks interesting and like something I would enjoy! A bowl full of goodness! What a gorgeous salad this is. Wow! Wat a beautiful presentation for this healthy salad! hey…I was wondering for a recipe that doesnt involve the use of oil.. I have just joined gym and I really wanna reduce weight…I have tried possible ways of eating moong raw..but yuk..
could u suggest me some recipe? Hello, I tried this today and it turned out really well, only I added green chilles too along with the red because I like it a little more on the spicy side.